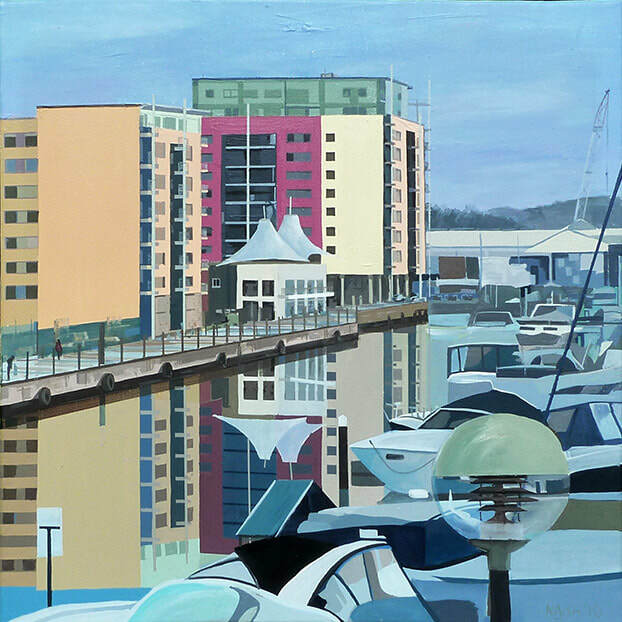 This began as a painting in situ looking from a hotel window across the marina. It was quite tricky to find a composition amongst the array of bobbing masts and hulls. The scrambling dog finding its owners cleaning their boat. Boats coming in and going out. Perpetual grey variations of something attempting to be weather. I chose the buildings in the distance as some sort of anchor (pun noted). The sphere of the pole light at the front seemed to create a composition. So, I gridded the canvas and transferred a pencil sketch to the canvas. Painting rapidly added shape and colour but little detail. I took numerous photos on the day too, weirdly none really lining up coherently with my image. Stage two occurred some months later back in the studio. This was to “round up” the shapes and colours to become crisper blocks and colours. It was at this point that I decided to change the water to take on “fully reflective mode”. Some boat elements needed to gain detail and precision of shape – though not a complete re-draw based on photos. I like the way boats don’t make sense as true objects, yet enough of each exists to give it the sense of the reality. I added much line work to buildings using masking tape. Finally, enough detail seemed to be present to suggest intent. Hopefully this image means something to people. For me, I’m fairly lost in the processes and visual balance as a goal. Time to move on ….